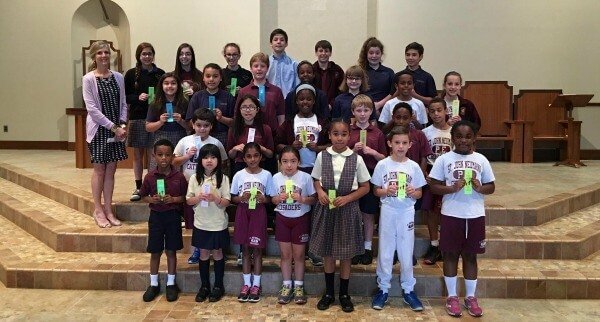 St. John Neumann Regional Catholic School students are recognized for their academic and physical accomplishments in a variety of ways. These awards only spotlight a few of the many examples of educational excellence St. John Neumann Regional Catholic School has to offer. Virtues in Practice – Virtues in Practice is a program in which all students participate throughout the year that encourages our children to grow in virtues and see the virtues as concrete expressions of our faith. The whole school studies the same virtue each month. The homeroom teachers along with input from our Special’s teachers identify a student who exemplified that virtue in their thoughts and actions from each class, and they are recognized at the end of the month. To learn more about this program click here. 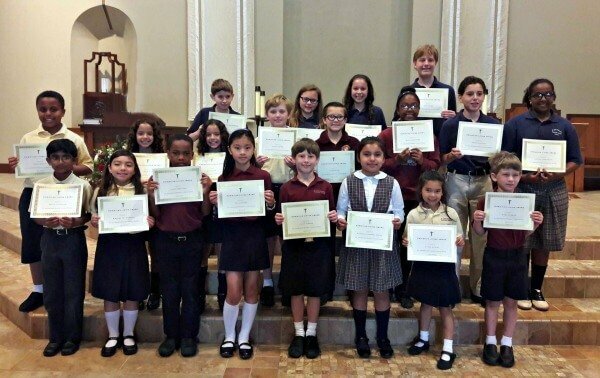 Blessed Trinity Book Award – Blessed Trinity Catholic High School presents a book award each year to an outstanding seventh-grade student. Through the centuries, books have been one of the most valued and valuable possessions a person could own. It is for this reason that a book is given to the student in recognition of academic achievement. The student is chosen by the faculty and administration of St. John Neumann Regional Catholic School. Chi-Rho Award – St. Pius X Catholic High School sponsors the Chi-Rho Award. It is presented to one eighth-grade student at each of the Catholic grade schools in the Atlanta Archdiocese. Chosen by the school’s faculty, this student possesses those qualities of faith, determination, caring and integrity which are needed to pursue an education to the best of one’s ability. Junior National Young Leaders Conference – Sixth-grade students, chosen by the middle school faculty for their leadership and academic qualities, are invited to attend a session of the JrNYLC in Washington, D.C. This conference helps students develop and sharpen their leadership skills by examining the leaders of the past and focusing on social advocacy to make a positive impact in their community and the world. Distinctive site experiences, hands-on exercises and workshops bring these concepts to life and are designed to educate, inspire and motivate students by giving them the confidence and leadership skills that will take them through high school and beyond. Students gain a better understanding of what is needed to become an effective leader. Presidential Awards for Academic Excellence – Since 1983, this program has provided individual recognition from the President and the U.S. Secretary of Education to those students whose outstanding efforts have enabled them to meet challenging standards of excellence. Students in fifth and eighth grade are honored for their outstanding academic achievement, identified by their GPA’s and ITBS scores. Students receive a certificate and lapel pin and are recognized during the school’s award ceremonies for their achievement and hard work. Student Leadership Conference – The student government at Blessed Trinity Catholic High School hosts a conference for seventh-grade students who are identified by the administration and faculty as leaders and potential leaders of our school. Up to three students are invited to attend the leadership training. Presentations on effective leadership and group dynamics as well as various team building exercises and activities fill the day’s agenda. Christian Living Award – This award is given to those students in our school who live their Christian values in everything they do. They show a consistent effort in their academics, possess a very good attitude, have a strong sense of responsibility, are always cooperative and enjoy participating in activities. This award is presented at our year-end student Mass. Citizenship Award – Students are chosen from each homeroom to receive the annual Citizenship Award. These students show a genuine love and concern for the people around them. They are the students who have a sense of responsibility and accountability. They are willing to serve others whenever they see a need. This award is presented at our year-end student Mass. Duke TIP – The Duke University Talent Identification Program helps in identifying academically gifted students and provides them with innovative programs to support their development. Based on their sixth grade ITBS results, academically talented seventh-grade students are given the opportunity to take the SAT college entrance exam, which allows them greater insight into their academic abilities. In addition to receiving a certificate recognizing their participation, students with outstanding scores are honored for their achievements. Exceptional performance on the SAT may qualify students for an Independent Learning Program, Scholar Weekend, or a Summer Studies Program. President’s Challenge – The President’s Physical Fitness Challenge is a presidential awards program to motivate students to start and maintain a regular physical activity program for health and overall well-being. Starting with the Presidential Physical Fitness Award in 1966, the President’s Challenge has rewarded and motivated millions of youth. Students receive Presidential recognition for their level of accomplishment in the five events of the Physical Fitness Test: curl-ups, shuttle run, endurance run/walk, pull-ups, and sit and reach. Based on the program qualifications, the students may receive the Presidential Physical Fitness Award or the National Physical Fitness Award, consisting of certificates, medals, and patches. Young Poets Publication – Creative Communication, Inc. sponsors a national poetry contest to bring recognition to student poets. Students compete against their peers in both age and region for their poems to be published. The top ten poets in each grade division receive a savings bond. Poems written as class assignments are submitted in the fall. The majority of our eighth-grade students have had poems published in Celebrate: Young Poets Speak Out. Several eighth-graders have also received awards as one of the top ten poets.